Not all blog posts are created equal, take a look behind the scenes of the Tripbase blog to see which posts made your day, which ones bombed and which ones made your blood boil. I’ve learned so much since my very first blog post back in April 2009. I never really know if a post will take off or die a slow death, but I’m able to make a much more accurate guess. But, like most bloggers, I realize I still have so much more to learn! It’s this feeling of knowing but not knowing, along with some inspiration from a post I came across a while back, that gave me the idea to start the online blogging initiative: My 7 Links. Here are my My 7 links! (bear in mind that I’m more of an Editor than a Writer these days so they’re not all written by me). Readers went nuts for these stunning photos – proof that images can make or break a blog post. Everyone loves this warm and fuzzy feel-good post demonstrating that happiness is fundamentally what we all strive for. This post was met with a heated discussion and some punchy comments. Lessons learned: hate is a strong word and people are passionate about where they live. A post that brought aspiring English Teachers together seeking info and swapping stories -evidence that it’s possible to build a community around the right topic. This post went wild – who knew Math could be so fun?! Note to self: people like to learn. There’s some great advice in this post did it didn’t get much traction. At 1,248 words, it’s a bit of a beast. What I know now: that attention spans are short online. I love this post. It’s original, it was loads of fun to write and it got people talking. It also taught me that quizzes are still very much alive and well online! ps. if you liked that one, you’ll love this one: 21 Signs You’re a Travel Addict. What do you think of My 7 Links? Why are we so obsessed with happiness? Why is it un-cool to hate Delhi? Post up your comments below. 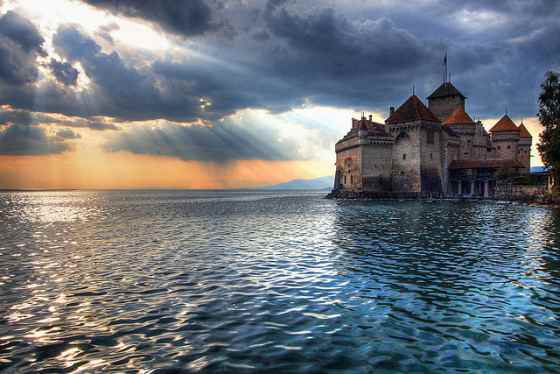 Main image: The Sun Sets on Château de Chillon by Pear Biter. We’re just getting started blogging about travel and health. I really appreciate your reflection on your blogging experience and the idea of “My 7 Links.” Hopefully I will be able to contribute “my 7″ next year. I look forward to meeting some others who travel and who have more experience than I, in blogging. Donald, a Nuclear Cardiologist, is the health expert, and we share our passion for travel. He writes, I blog. Thanks, also, for the recommendations of the other travel bloggers sites. Great post, I did this 7 links challenge myself last year and I too had a post on India as my most controversial with the titile India is Filthy. Yes, a heated discussion ensued. I remember your mathematical building post, I loved it! Congratulations on 2 successful years, I have been following your blog and absolutely love it. Here to another 20! I have not taken part in this challenge yet, but my most controversial post would also be about India–when I dissed Mumbai after the movie Slumdog Millionaire came out. Great idea, I should do a 7 links sometime too! Katie, hating Delhi is not uncool, everyone is free to their opinion. What was uncool was the total disrespect for the people who live there and the narrow-mindedness of the author. It was antithetical to travel, in my opinion. Hi! The 7 posts thing has really taken off now! I’ve been nominated – and I’m finding some blog posts that even I’d forgotten!! Look forward to finding some great new reads through this initiative!! Hi Katie, I hope this is the right place to post my My 7 Links url http://www.solofemaletraveler.com/best-of-solo-female-traveler/. Thanks a lot! 8 Reasons Why I Hate Delhi – Lessons learned: hate is a strong word and people are passionate about where they live. Have you? From the post that I have read I could see most of the ‘passionate’ (against your conclusions) comments belong not to Delhi-ites but readers from other part of the world. People are not just passionate about where they live, they can also be passionate about where they have traveled. But then meanings are contextual and one thing I have learned is that you have the right to have an opinion but to pass judgement is a different thing altogether. And I seriously believe that most of the writings (blogs) are inevitably subjective – after all when I write I am laying bare my soul, mentality and way of perceiving things as I see them. So it’s really no use criticizing other for what they think and value. In the end we need to realize that all humans are unique. What a great idea! Thank you for sharing it!! I love #My7Links! I’m discovering so many amazing blogs. I finally got my post up: http://cemeterytravel.com/2011/08/09/my-7-links/ It was so much fun to participate! What a great idea, I just posted my own 7 Links! I remember doing 7 links some time back. It is great going back to old posts. What a great idea. I’m six months into my own rtw trip. Being constantly on the road, we’re extremely busy, so you sometimes forget what amazing experiences and things you’ve seen. That’s why I created my own travel blog, so once our flashpacking adventure ends, we can reminisce about our trip of a lifetime. Happy travels.